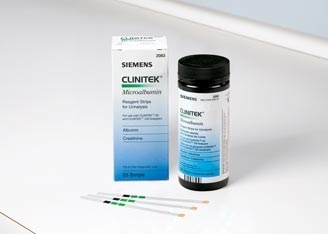 CLINITEK Microalbumin Reagent Test Strips are for use with the Clinitek Status Analyzer. Using a small amount of urine, this test measures very small amounts of a protein called albumin. Albumin is produced by your liver and your body uses it to grow and repair tissues as well as get rid of extra fluid. When the kidneys are diseased or damaged, it’s easier for larger substances to pass into the urine. Albumin is one of the first larger substances to show up in the urine when the kidneys are damaged. For this reason, the microalbumin test, is a good screening test for early kidney disease. The CLINITEK Status®+ Analyzer features new automatic checks (Auto-Checks*). 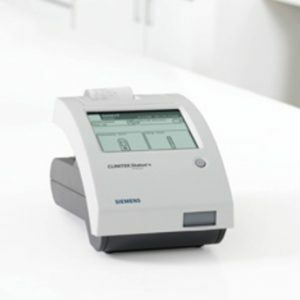 The analyzer automatically checks each test strip for humidity exposure, common sample interference’s and strip identification for Siemens test strips. Together, these provide improved clinical information.